I often get asked by people familiar with my religious tradition--the Churches of Christ--how I became the person I am, theologically speaking. The answer is simple: In college I stumbled upon the works of George MacDonald. I'm currently rereading MacDonald's Unspoken Sermons. Given that I'd like to post quotes from Unspoken Sermons in the coming weeks I thought I would introduce MacDonald to those of you who might be unfamiliar with his work. I came to MacDonald the way many people come to him: Through C.S. Lewis. I had read a lot of Lewis' work, fiction and non-fiction, in college. Lewis was, essentially, the first time I was exposed to theology. A fond memory from college was being a sophomore invited to a C.S. Lewis reading group hosted by my favorite philosophy professor. Having read most of Lewis' work in that group I asked my professor about similar writers and thinkers. He gave me G.K. Chesterton's Orthodoxy, still one of my favorite books. Later, having read most of Chesterton's work (including Father Brown) I asked for more. He pointed me to George MacDonald. Due to my familiarity with C.S. Lewis I was vaguely aware of MacDonald. In the book The Great Divorce George MacDonald is the heavenly guide for the narrator of the story. Further, if you know anything about C.S. Lewis' spiritual biography you know that his encounter with MacDonald's faerie story Phantastes was a critical moment in his life. It was the moment when Lewis claimed that his imagination, at the age of sixteen, became "baptized." Lewis would come to consider George MacDonald to be his spiritual "master." In fact, Lewis edited and published an anthology of MacDonald's work. 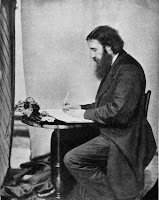 George MacDonald (1824-1905) was a Scottish writer and minister. During his time MacDonald was mostly known for his Gothic novels. MacDonald was a good friend and mentor to Lewis Carroll. MacDonald's children so loved Carroll's Alice stories it gave Carroll the confidence to get the work published. MacDonald was also friends with many other literary luminaries, American and British, from Walt Whitman to John Ruskin to Mark Twain to Henry Wadsworth Longfellow. There is a photo of the "great writers of the day" that includes George MacDonald along with Tennyson, Dickens, Wilkie Collins, Trollope, Ruskin, Lewes, and Thackeray. In short, MacDonald was very well known in literary circles and the general public during his day. Unfortunately, MacDonald's fiction works have not held up over time. Of the writers included in that photograph MacDonald is likely the least well known amongst contemporary English majors. There are a couple of different reasons for this. One of MacDonald's specialties was the faerie story, Phantastes (of C.S. Lewis fame), Lilith, The Princess and the Goblin and At the Back of the North Wind are considered to be his best work in this genre. But these faerie stories haven't held up with modern readers as well as, let's say, the novels of Charles Dickens. Plus, I tried to read Phantastes and, honestly, I couldn't see what in the world C.S. Lewis saw in the book. It's a pretty bizarre story. I also couldn't make heads or tails of Lilith. That said, however, At the Back of the North Wind was one of the most profound books I have ever read. All my work in relation to death and Christian faith traces back to At the Back of the North Wind (more on that, I hope, in a future post). Having failed to make sense of Phantastes I was intent on finding something else MacDonald had written. Something that wasn't a faerie story. Right around this time Bethany House was republishing many of MacDonald's Gothic novels. These were edited by Michael R. Phillips. To "help" the modern reader Phillips condensed the novels and translated the Scottish dialect of many of the characters (which, in the original, is pretty impenetrable). This series is now out of print but you can still buy them used at Amazon. These novels are, to be honest, not the greatest as lasting literature. Which is the other reason MacDonald hasn't lasting literary fame. But I read novel after novel. Despite the odd plots, I was riveted. And it was a life changing experience. Why did these novels from the dustbin of literary history so affect me? Two reasons. First was MacDonald's view of sin and grace and the refining and inescapable love of God. Many of MacDonald's protagonists make horrible mistakes. And their salvation is this slow journey though the purifying love of God. Sin is "forgiven" in MacDonald's novels when the character embraces the harsh consequences of sin and moves through that painful fire. Salvation isn't a simple "forgiveness," avoiding God's consequences for sin. In fact, the worst thing possible, the real hell, is NOT suffering the consequences sin. Salvation, in short, is about character formation. And this formation must, absolutely must, involve removing sin from our hearts and minds. God, I learned from MacDonald, wants us to be clean. Not pseudo-clean, not bait and switch clean, not imputed righteousness clean, not "God sees Jesus and not me" clean, but really, truly clean. You and I, finally, coming into the love of God and becoming the people we were created to be. And you have to go through the purifying fires of hell to get there. God wants to save us from sin. Not the consequences of sin. The second thing that affected me about MacDonald's novels were his protagonists. Despite MacDonald's religious slant his protagonists were, conspicuously, devoid of religiosity. And yet, these characters were rooted in faith. What shows through most clearly is their virtue, not their piety. Most of the time the characters are lower class, but the way they carry themselves is almost regal. There is something inside them that just glows from the inside out. Moral integrity is their defining feature. And kindness. And courage. And a simple, easy unpretentiousness, feeling at home in one's skin and with anyone in the world, king or tramp. And that's how I define Christ-likeness to this day: Moral integrity, kindness, courage, lack of overt religiosity, simple manners, unpretentiousness, at ease with rich and poor. In short, I saw a vision of Christ in MacDonald's characters. The plot lines were goofy, but I loved the Christ-likeness of the characters. They showed me ways to be like Jesus in my day to day interactions with others. I wanted to be like the characters in the stories. A bit of theology creeps into MacDonald's novels. But you might read a whole novel and only get this one little gem, a few lines about God's love. Eventually, I found out that MacDonald published some straight theological work, his Unspoken Sermons being the most important. These sermons give you the theological worldview that informs MacDonald's novels and fantasy work. Unspoken Sermons changed my life. Completely turned me upside down. In Sermons a view of God opened up before me and I've never let it go. Sermons guides every theological impulse I have. All in all, everything you hear me say about God on this blog is really just my take on George MacDonald. Like C.S. Lewis, I consider him my "master." But for me the conversion wasn't with Phantastes. That's one odd book. No, for me it was Unspoken Sermons. And I'll be posting quotes from the sermons in the weeks to come. Oh, when I think of Unspoken Sermons I think of the first time I read it, devoured it. It was a perfect time for me to meet that book, having laid down the eternal hell thang with relish (never picked it up truly, not really) and reading this felt like drinking light. I'm so glad you're doing this. I'd suspected you'd had some MacDonald influence, though you'd never said so before. I also came to MacDonald via Lewis. And I agree about Phantastes and Lilith. Unspoken Sermons did the same for me: It completely crucified the theology I had grown up in, and brought to life a richer, fuller, more gracious understanding of God, salvation, forgiveness, and life than I had ever met in church. Last year I read his son's biography of him, titled George MacDonald and His Wife, by Dr. Greville MacDonald. Sometimes learning the historical details about a man's life makes his statements of belief less credible. Not so with MacDonald. His life and words measured each other with integrity. You sold me. George MacDonald just made the reading list. Thanks! Just received "Unspoken Sermons" from Amazon over the weekend. It's about three books deep on my current reading list, but I'm looking forward to it. My experience with MacDonald's is quite similar to your own. When people ask me whom from all of history I would most like to spend an evening with, they might expect me to say, Paul, or David, or John, or Luther, or Francis, etc., My answer? George MacDonald! Thank you for your wonderful reminder! I've only read 'justice' but it helped open my eyes for sure. This is a beautiful post. I've only read bits of MacDonald but I hope to give him the attention he deserves at some point. For me, C.S. Lewis continues to be this kind of theological voice in my head. I hope to add MacDonald and Chesterton in time. I will read MacDonald, thank for the tip. I regularly plan to reread Chesterton and Lewis, both men politically and culturally on the right and on National Reviews reading list of top conserative books. Well you convinced me. :) I ordered "At the Back of the North Wind" this morning and it should be here Monday. I just finish "At the Back. . ." a few hours ago. I am not sure, but it may color the rest of my life. I have not read The Interior Castle, partly because I don't think I'm pure enough(whether yet or ever i'll be--i cant tell). This book I perhaps should have treated similarly, but I don't know (and didn't at any rate). I thank you very much for bringing it up, though. I had quit MacDonald after Phantastes, even though there was beauty in it. I've now ordered the Unspoken Sermons. I haven't checked the American Amazon store but in the UK his complete works are available in their Kindle store for 5 bucks. I do share your admiration of MacDonald to a point. But that “God wants to save us from sin. Not the consequences of sin” may be one of the saddest false dichotomies I've read yet. As if Romans 5 does not precede Romans 6. Loud strong Yeses. The modernized versions of the MacDonald novels are literary manslaughter. MacDonald has faults as a novelist, but it is his virtues, not his faults, that the modernizers strip out. Especially his Scotch. When his characters speak dialect Scotch (as opposed to "English") they come to life, they are real, they matter. Everything acquires an edge. One must learn the trick of reading phonetically and accepting some unknown words -- but that's just how we all started reading, isn't it? Among readers, mileage must vary, should vary, does vary. But I'll just testify that have found the MacDonald novels, especially the ones set in Scotland, a solid meal. And I'm curious if you've ever returned to Phantastes, tried it again. It left me cold when I was in high school and looking for some fantasy writer to stand next to Tolkien, but now it gives me hot and cold chills, and I can't read it aloud without choking up. All of Lilith likewise except the bits with the cherubic "Lovers." I love all GM's fairy tales but would rate The Golden Key higher than At the Back of the North Wind . . . Well, Chesterton adored The Princess and the Goblin, Tolkien favored The Golden Key, Lewis rated Phantastes mostly highly, and you cast your lot with North Wind . . . to quote an annoying buzz-phrase, "It's all good!" I am reading George's Trilogy about Wingfold the curate right now. I think I have read all three in the past, but I need them again after a few years go by. I, too, am struck by the vision of Christ in the characters. Now I am going to look for Unspoken Sermons. I am excited to learn that it exists. Definitely agree with you here! Its funny because I first read Phantastes about a year ago when I was 15yrs old, very similar to Lewis. There was something about that book that made it wonderful...not sure what, honestly, I couldn't tell you much about the plot. All I remember is almost as if the book grasped me and wouldn't let go until the last page. A few months ago I read Unspoken Sermons and, like many have already said, completely altered my understanding of God given to me by church. Never before had I ever read something that made me feel so close to God as his books. Truly masterpieces!! Phantastes was my first foray into MacDonald and although I would partially agree with it being way out there, there is some amazing beauty in it. Ever since I've been devouring everything he's written via the awesome collected works for Kindle, and everything, from his children's stories to poetry, novels, and fantasy, the all just ooze the goodness of the Lord. I know it's probably dangerous from a theological standpoint, but I find it myself agreeing with MacDonald on anything about God simply because it's hard to believe someone who was clearly so close to Christ would be wrong about Him. The little I've read about MacDonald's life indicates he didn't just write Christ into everything, but lived it as well.